Description: Andrew Murray discusses how you can make your prayers more effective. 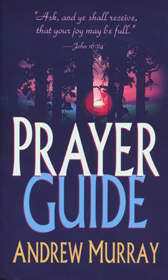 This book contains prayer topics that will show you what to pray for and how to pray. As you learn about prayer, you will realize that it is the most important and rewarding thing you can do each day. Prayer Guide is divided into thirty-one sections to be used as a month devotional that will lead the reader in a month long journey of learning how to pray.